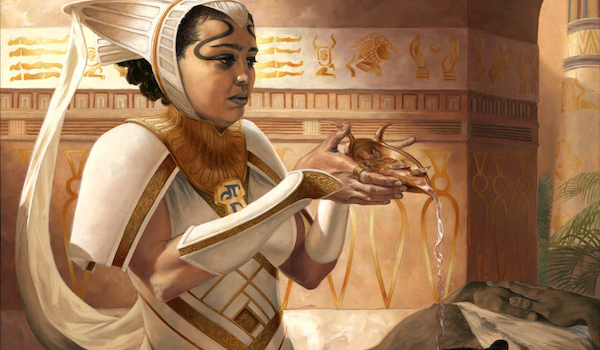 When Amonkhet spoiled, Vizier of Remedies sparked interest among Modern players as a possible redundancy boost to Abzan Company, the grandchild of beloved Modern archetype pillar Birthing Pod. It’s been nearly a month now since the set was released to Modern, and Vizier seems to have succeeded in improving Abzan Company… as well as in spawning some Company variants of its own! Today, we’ll check in on Vizier’s progress and go over the decks it fits into. Together, Vizier of Remedies and Devoted Druid make infinite mana. That’s an interaction I wrongly glossed over as superfluous in my set review—after all, it doesn’t even win without a way to spend the mana. But Vizier-Druid has been putting up interesting results online in different shells, so I decided to figure out what the combo has that Abzan Company doesn’t. Grafdigger’s Cage, one of Modern’s most splashable sideboard cards, is the bane of Abzan Company. Not only can Company no longer use their namesake card or Chord of Calling with Cage in play, but should they assemble the combo naturally, Cage stops Kitchen Finks from ever persisting. Surgical Extraction, too, has been gaining steam as a super-flexible way to combat strategies like Dredge, Company, and even Death’s Shadow; this card blows out the combo while opponents are tapped out by exiling all copies of Finks in response to its persist trigger. If Vizier-Druid has one huge draw, it’s that these cards don’t affect it. The new combo doesn’t care about the graveyard at all, allowing it even to defeat hosers like Leyline of the Void. As a cost for this immunity, players must include in their decks a number of ways to win after assembling infinite mana, and none of them are quite as useful on their own as Viscera Seer. That load is lightened by the fact that Chord and CoCo can now be cast for free. Decks that attack from multiple angles have a good time in Modern. Take Splinter Twin, a deck in part banned for its flexibility, or Knightfall, a Company deck gaining momentum online. Abzan Company has always had a fair plan and a combo plan, but Vizier lets the deck split that combo plan into two directions. Traditional Abzan Company lists are still enjoying some success, too; both decks benefit from opponents never knowing which combo to playing around until later in the match. Now we’ll look at four different Vizier builds. I’ll rate each, in relation to one another, on a scale of 1-3 (with 1 being awful, 3 being great) using the three metrics I consider integral to Modern success: proactivity, interactivity, and consistency. Our first deck marks Vizier’s breakout success in its own shell. Kevin Page took a deck singularly focused on the Vizier-Druid interaction to 19th place at the Atlanta Classic last month. Kevin has a few interesting things going on in this list. Most arresting is his full set of Simian Spirit Guide, which accelerates the combo by a full turn. I have long touted Guide’s power and splashability in a format so tempo-focused, so the card’s showings in strategies as diverse as Zoo and now Company doesn’t surprise me. Modern’s most explosive combo decks, including Grishoalbrand, Blazing Infect, and Amulet Bloom, are known for their ability to produce turn-two kills; Guide gives this deck the same dimension, powering out a combo piece on turn one and letting pilots do the rest next turn. Walking Ballista, Rhonas the Indomitable, and Duskwatch Recruiter make up the deck’s win conditions. Ballista provides the most immediate kill, as infinite mana makes it arbitrarily large and deals as much damage as pilots want. Rhonas serves as a Chordable win condition that doesn’t care about hate cards like Stony Silence, a Pithing Needle that named Ballista, or a Surgical Extraction that removed the artifact. Recruiter allows pilots to dig through their deck until they find one of these creatures. Although it doesn’t go infinite, Anafenza, Kin-Tree Spirit certainly improves the deck’s four Ballistas. Ballista is best in high numbers here since it can’t be Chorded for or put into play with a Company without immediately dying to state-based actions, and I like having a way to make it better. Lastly, Kevin included a set of Path to Exile in his deck. The Abzan Company decks of old rarely had room for mainboard Paths, which already bodes well for the Vizier decks. Speaking of Abzan Company, up next we have a relatively traditional build of the deck that pushes around some moving parts to incorporate an unadulterated Vizier package. Dispencer 5-0’d a MODO league with this deck a week ago today. Dispencer doesn’t play more dorks than Kevin, but he does omit the Guides. That means he’s willing to give up some explosiveness—but for what? Well, including both the traditional Abzan Company lifegain combo and the new Vizier combo makes Collected Company significantly more dangerous. The odds of hitting one of the two combos with a Company skyrocket with so many enablers, especially since Vizier of Remedies itself plays double-duty as a Melira effect for Kitchen Finks and as the other half of the Devoted Druid combo. Finks is a decent card on its own in many matchups, and the same can be said for Viscera Seer, which gives adding the traditional combo extra appeal. As for disruption, Dispencer opts for Fatal Push over Path to Exile in his list. I think the change is pretty much a strict upgrade in this metagame and one of the big draws to splashing black (the others being a second combo, thanks to Viscera Seer, and Collective Brutality in the sideboard). Three days after Dispencer’s finish, Madsutzo went 5-0 with a more streamlined Vizier deck. His cuts Kevin’s Guides for six more mana dorks, giving it similarly explosive starts and superior mulligans. There are two big factors to talk about with this list. For one, the whopping ten dorks all but ensure Madsutzo opens on one. But winning on turn two requires four mana, not three, so what gives? This deck uses its frequent three mana to cast Renegade Rallier on turn two, getting back a land to offer up to five mana on the following turn. Madsutzo’s deck is therefore very focused on turn three, which is when it goes for the kill. Renegade Rallier also notably reanimates any combo piece with revolt activated—Druid, Vizier, and even Recruiter. In longer games, it becomes a one-card win-condition and pressures opponents to keep the board totally clear. Second, Madsutzo’s build includes an interesting tech choice for Company decks: Thalia, Guardian of Thraben. Nothing puts the hurt on an opponent’s cheap answers like a Sphere of Resistance effect, and Thalia can bring the beats when she needs to. I especially like her in conjunction with Renegade Rallier, another card with a relevant effect. Combined, the two form a four-turn clock, letting Madsutzo’s deck play fair better than Kevin’s. It’s a shame this deck can’t fit any hard removal in its mainboard, but Madsutzo does have his requisite set of Paths in the side. The last deck we’ll look at today abuses the snubbed Eldritch Evolution, and re-introduces to Modern one of the format’s most archetypal riches-to-rags stories: Spellskite. syounennAattyan’s WG deck plays plenty of dorks, like Madsutzo’s, and similarly foregoes removal in the main. It’s built to take advantage of Eldritch Evolution by turning those dorks into combo pieces or Spellskites with which to protect combo pieces. There’s nothing flossy going on here; syounennAattyan’s spiciest Evolution payoff is Eternal Witness, whose primary purpose here is likely to retrieve Companies. To be honest, I doubt this build has much over Madsutzo’s. There’s a reason nobody plays Eldritch Evolution: it’s freaking expensive! By the time syounennAattyan casts the sorcery, Kevin Page may have already won. Besides, Renegade Rallier seems like a superior turn-two play, since it doesn’t eat a creature and has more utility in the late-game. The reason to play syounennAattyan’s build, if any, is access to a post-board toolbox. But if I wanted to toolbox, I would just go with a more classic Abzan Company variant. With Lightning Bolt seeing play at all-time-low numbers, Company decks are poised for a resurgence. I think the introduction of Vizier of Remedies to Modern gives them exactly the kind of juice they need to enjoy breakout performances at the coming Modern GPs. Whether you love or hate Company, such an outcome would at least yield a stock list; the first two presented in this article look the best to me, but to know which builds end up most successful, we’ll have to wait and see. hi Jordan, Devoted Druid does not have haste, so saying “winning on turn two requires 4 mana” is verrry misleading. devoted druid needs to be on the board the turn before you go off. it needs to be down on turn one to go off on turn 2, which the deck with the monkeys can do, or it needs to be down on turn 2 to go off on turn 3, which … you just need 2 lands, so I don’t really see the necessity of playing 10 dorks. also if we’re following your logic that bolts are at an all-time low, then spellskite is probably bad right now, cause that’s basically the only removal spell it’s worthwhile against in my experience playing the deck. selfless spirit is just a superior option in that slot. “My logic” that Bolts are at an all-time low is just based on mtggoldfish’s numbers, which has the card sitting at 18.99%. I have been playing Modern since its inception and closely follow these numbers; it has always been rare to see the card below 40%, and it has never fallen below 20% other than during Eldrazi Winter. Agree on Skite. You’ll notice I rated the 4-Skite list lowest out of all the builds featured in this article! Interesting read :0) what do you make of the recent naya lists cropping up, which forgo the classic viscera seer loop and have red for nahiri and kessig wolf run?